These cases date pre-1900, several prominent cases do not appear on this list because they are either hoaxes or have been further researched and were simply not authentic, most notable is the 'Alexander the Great Case of 329 BC', otherwise these incidents have all been deemed legitimate. These cases include the Nuremberg Sighting of 1034 through to the Great California Airship of 1897. There will be a few more cases added shortly if research bears out there authenticity. There are other sightings that have their origin in the Bible, those are too numerous to list here. 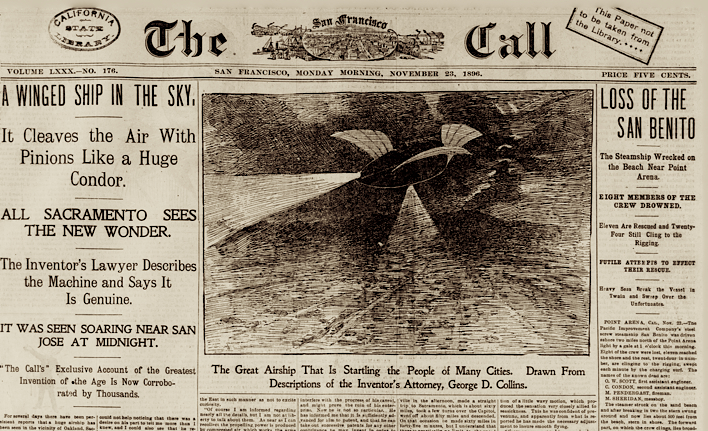 Reports of UFOs were recorded in newspapers of the 19th century. 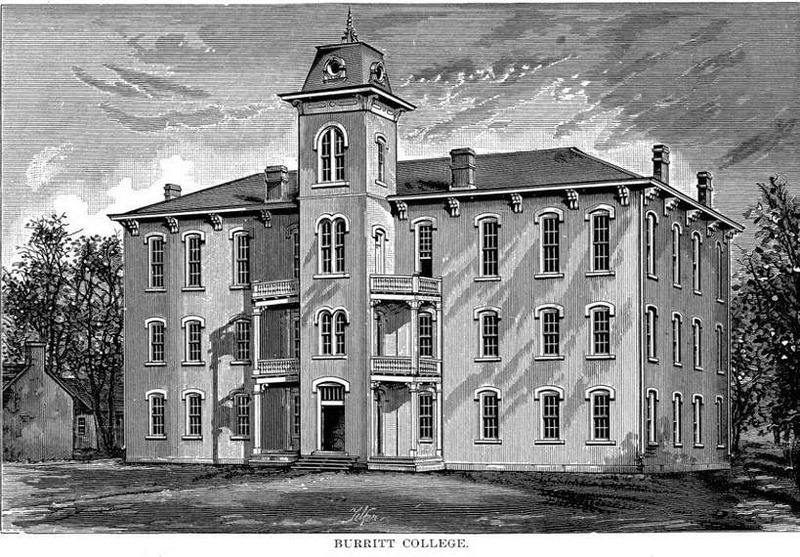 One of the most famous cases of the time appeared in the St. Louis Democrat, Oct. 19, 1865. That article also appeared two weeks later in The Cincinnati Commercial, bringing more public awareness to UFOs. 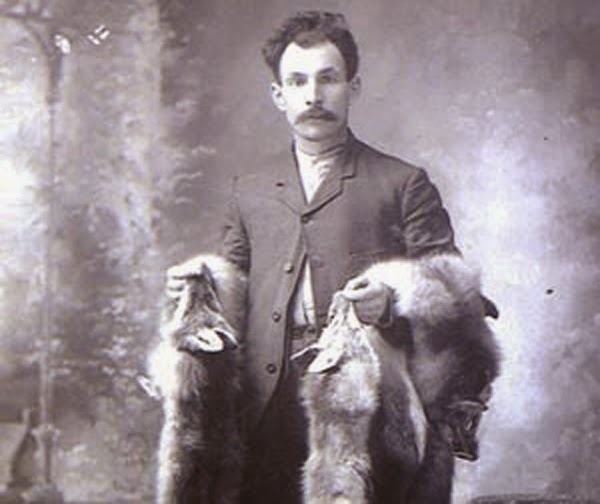 The account was of an old Montana fir trapper by the name of James Lumley who saw a UFO fly over him and crash into the forest, "exploding like a rocket". Lumley reported that there was hieroglyph writing and glass on the side of the craft which made this case extremely intriguing. To read about more about the James Lumley UFO. Over 60 years before alien abduction claims became mainstream, two people were nearly abducted in Lodi, California. Colonel H. G. Shaw, along with his friend Camille Spooner, had a close encounter with previously unknown entities, traveling with their UFO in 1896. 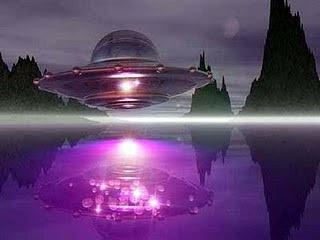 Not many people know that seeing unidentified lights in the sky goes back over a century, when the first UFO “flap” (a grouping of UFO sightings made over a specific area within a few months) occurred over a hundred years ago in the waning years of the nineteenth century. It all began when a mysterious unidentified light was observed by hundreds of people moving slowly over Sacramento, California in November, 1896, apparently moving against the wind at a leisurely thirty miles an hour. It was seen again a week later, this time over San Francisco; by the end of the year hundreds of reports of the thing were coming in from all over the Pacific coast, creating a media frenzy. 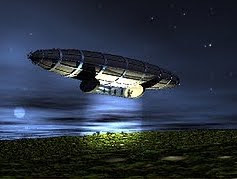 To read more about the Great California Airship UFO. 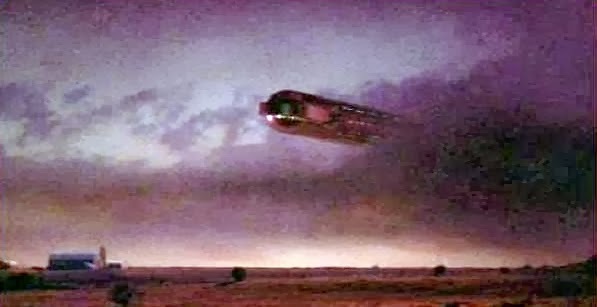 To read more about the Aurora Texas UFO crash. The occupants, completely terror stricken, and believing, as they relate, that the end of the world had come, threw themselves on their knees and commenced to pray, but their devotions were almost immediately interrupted by violent vomiting and extensive swellings commenced to appear in the upper part of their bodies, this being particularly noticeable about the face and lips. To read more about the Maracaibo UFO Incident. "From Mr. John Martin, a farmer who lives some six miles south of this city, we learn the following strange story: Tuesday morning while out hunting, his attention was directed to a dark object high up in the southern sky. The peculiar shape and velocity with which the object seemed to approach riveted his attention and he strained his eyes to discover its character." 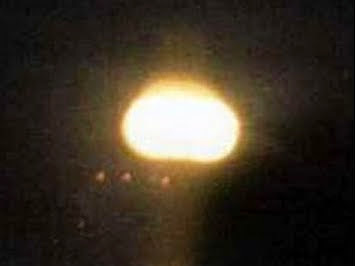 To read more about the Denison Texas UFO. "An oblong cloud moving more or less parallel to the horizon. Under this cloud could be seen a luminous object which soon became spherical, brilliantly lit, which came to a halt; this strange sphere seemed at first to be pale blue in colour but then its luminosity increased and soon it set off again towards the East. To read more about the Windsor Castle UFO. This is a French jeton minted in 1680, a coin-like educational tool that was commonly used to help people count money, or sometimes used as a money substitute for playing games. It is about the size of a U.S. quarter-dollar and similar to thousands of other jetons with different religious and educational designs that were produced and used in Europe during the 16th and 17th centuries. It appears to commemorate a UFO sighting of a saucer like object. Some researchers feel it represents the Biblical Ezekiel's wheel. The Latin inscription 'OPPORTUNUS ADEST' translates as 'It is here at an opportune time". 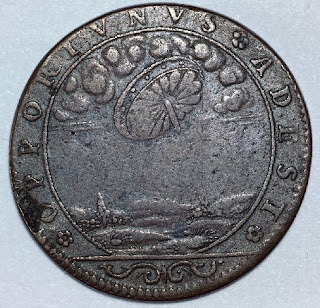 To read more about the French UFO coin of 1680. This illustration shows the sighting of two UFOs over Hamburg, Germany, November 4, 1697. The objects were described as "two glowing wheels". To read more about the Glowing Wheel UFOs over Hamburg. He would recall two accounts involving unidentified crafts. His first experience was in March of 1676, when he saw a, as he said, "Vast body apparently bigger than the moon. 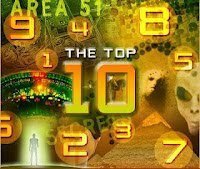 "To read more about the Edmund Halley UFO. In January 1644, America's first USO, or Unidentified Submerged Object, was sighted. 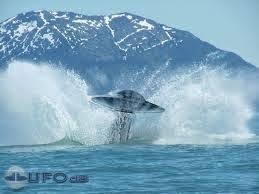 A USO is an aquatic UFO. Governor John Winthrop made two entries in his journal in regards to this unholy affair. In 1639, America's first UFO was sighted over the Charles River in Boston. Lights sped back and forth across the Charles River from Back Bay Fens to Charlestown. Governor John Winthrop made an entry in his journal regarding this strange event. 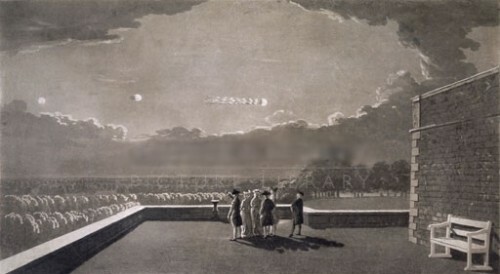 The primary witness was described as a man of good reputation, activity and estate in Boston: To read the full account of the first UFO Sighting in the United States. 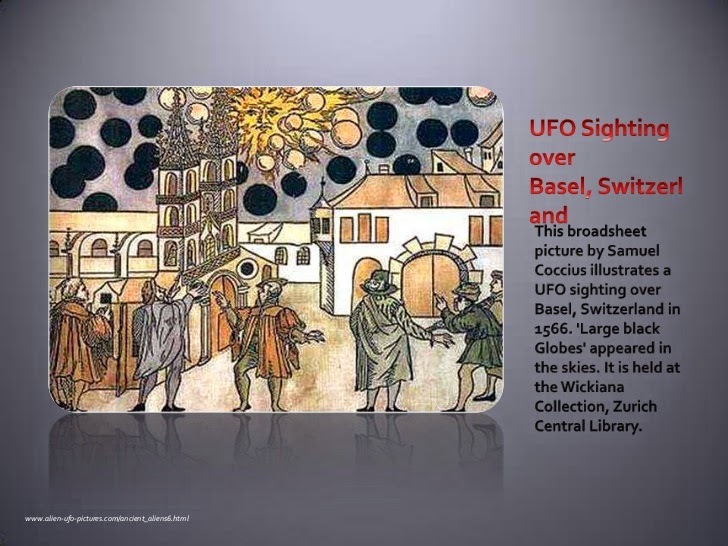 In Basel Switzerland on August 7, 1566, at dawn, many citizens became frightened when they witnessed black spheres in the sky involved in a formidable aerial battle for several hours. There was no doubt that the skies above their city were being invaded. 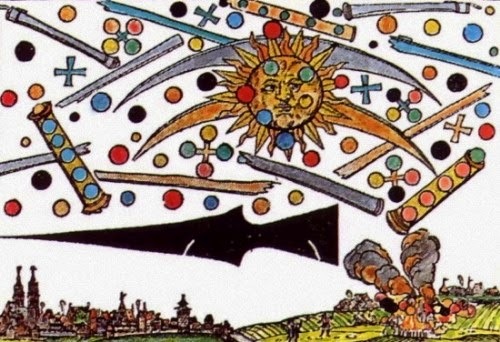 According to the Nuremberg Gazette, the "dreadful apparition" filled the morning sky with "cylindrical shapes from which emerged black, red, orange and blue-white spheres that darted about." 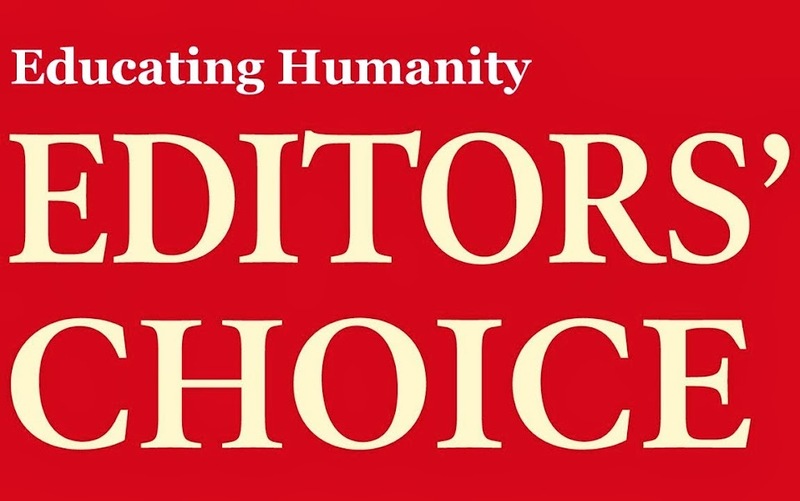 Between the spheres, there were "crosses with the color of blood" (i.e. red crosses). To read more about the Nuremberg UFO Sighting. Christopher Columbus and Pedro Gutierrez while on the deck of the Santa Maira, observed, "a light glimmering at a great distance." It vanished and reappeared several times during the night, moving up and down, "in sudden and passing gleams." 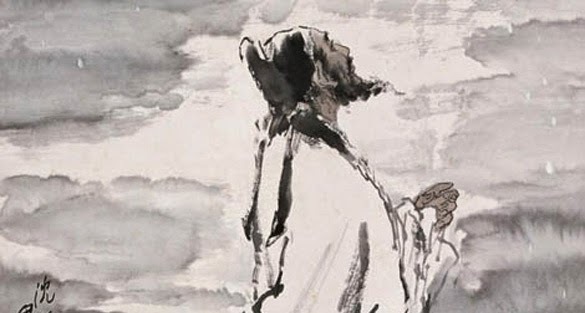 To read more on the Shen Kuo UFO sighting. The illustration accompanying the account shows a cigar-shaped form haloed by flames, sailing through a blue sky over a green, rolling countryside. This "may" be the first work that actually contains actual illustrations of UFO's. One email a day is all you will get.